Researchers in the School of Environmental and Rural Science at the University of New England (UNE) have been awarded a $1.3M grant from the world-renowned philanthropic organisation, the Bill and Melinda Gates Foundation. The UNE research group is headed by Professor John Gibson who co-ordinates the International Development Activities at the University’s School of Environmental and Rural Sciences. UNE will work in close collaboration with teams led by Dr Okeyo Mwai at International Livestock Research Institute (ILRI) in Nairobi, Kenya, and Dr Ed Rege at PICO-Eastern Africa, also based in Nairobi. Professor Gibson said he was elated to continue the partnership with the Foundation on a project which could have profound impacts on small-hold farming in East Africa and change the livelihoods of literally millions of family farms. 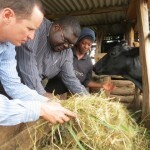 The grant extends a current project also funded by the Foundation, which is exploring successful breeding strategies for dairy cattle in Kenya and Uganda. Small-scale farmers in East Africa must contend with highly variable and unforgiving environmental conditions, plus devastating livestock diseases, which are rarely, if ever, seen in Australia. Despite these challenges, the addition of one or two milking cows to the can increase farm profitability and help alleviate poverty. “Dairy cows can provide farmers with a stable, relatively resilient income supplementing small crops and other income sources. Because the conditions in East Africa can be so harsh, the traditional dairy breeds we know in Australia, such as the Holstein, are crossed with local cattle resilient to local conditions. “Getting the right genetic mix between local and exotic stock can mean the difference between a successful farm and a family thrown into poverty. 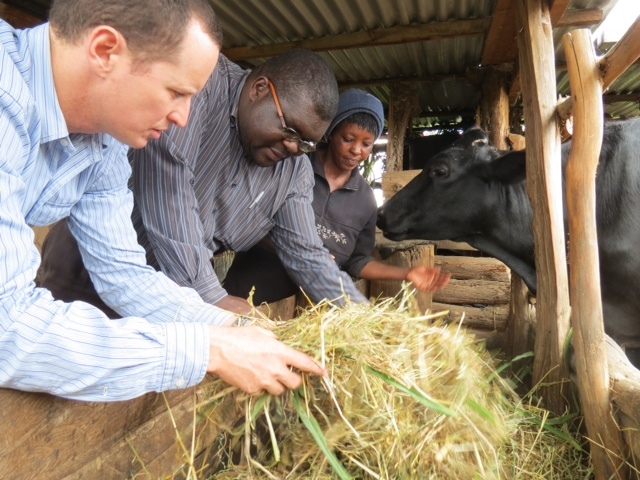 “In Kenya and Uganda, we worked hard to understand the breed mixes which would deliver a healthy yield of milk, while also retaining animal characteristics that help with drought resilience and tolerance to disease. Also, environmental conditions vary greatly in the region so that the ideal genetic mix changes district by district,” said Professor Gibson. “The new project funded by the Foundation builds on this work, expanding the scope to neighbouring Ethiopia and Tanzania,” said Professor Gibson. The ultimate goal of these projects is to not only understand the best breeding strategies for each district in the region, but to develop a system that enables farmers access to the right genetic material to implement the best strategy. “Creating a breeding program, which potentially leverages artificial insemination, becomes more than a scientific challenge – it’s an economic, social and political challenge. That’s a five to ten year project and our aim for this grant is to ensure the groundwork for setting up that system is laid,” said Professor Gibson. UNE’s principal campus is in Armidale, in the New England region of NSW. Armidale is a world-leader in livestock genetics and is the largest centre for livestock genetics in the world. This expertise is shouldered between a lasting partnership with the Department of Primary Industries, CSIRO and UNE. “The region has been in the top three centres-of-excellence in livestock genetics for the past 30 years. That’s a remarkable feat given the competition globally. This global standing has been a crucial factor in our success with the Foundation, which sees us as a safe pair of hands,” said Professor Gibson. Having retired as CEO of Microsoft, Bill Gates started the Foundation in 2000. The Foundation teams up with partners around the world to take on some tough challenges: extreme poverty and poor health in developing countries.